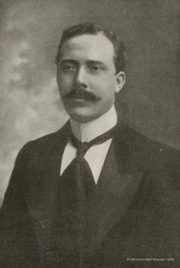 Our founder – Sir Oswald Stoll, theatre impresario and philanthropist. Sir Oswald Stoll’s legacy spans both the worlds of Theatre and Philanthropy. A shrewd businessman, Sir Oswald had shown a keen interest in economics at school. After some tough early years, Stoll joined with Moss and Thornton to create Moss Empires in 1900, eventually opening 28 “Empires” up and down the country. These included the iconic London Hippodrome and Coliseum, which staged the first Royal Variety Shows in 1912. When British troops were returning home from WWI with physical and mental injury, Sir Oswald was at the forefront of the debate of how best to support returning wounded Veterans. Using his standing and contacts, Sir Oswald set about establishing the War Seal Foundation, which provided a place to call home and vital support for injured Veterans and their families. He was knighted for his philanthropic efforts in the same year and the War Seal Foundation was renamed the Sir Oswald Stoll Foundation in his honour. The Fulham mansions is the original site that Sir Oswald donated to begin housing Veterans in 1916 and remains today. Stoll continues to be at the forefront of housing and support for vulnerable ex-Servicemen and women. Watch a brief history of how Stoll began.